We know the move around the world is a big one, and we are here to take the stress of relocating your pets off of your to do list! We pick up your pets from your home, make your pets’ airlines reservations, file required entry permits, process required blood panels, prepare crates for travel and ensure your pets are off safely to their new destination. We have sent many pets all over the world and are familiar with required import permits and regulations for countries all over the world! We take the stress away and will prepare your pets entire international relocation for you. If entry permits are required we file for all necessary permits, submit any documentation ahead of time to the entry authorities, and process any necessary blood work as well. Some countries REQUIRE a professional company accommodate your pet’s arrival and customs clearance, as an IPATA member we are members of a unique network of professional pet shippers who take great care in ensuring a successful relocation of your pet anywhere in the world. Several clients in Australia and New Zealand have used our services for relocating puppies to Australia and New Zealand. We pick them up from the local breeder, handle all vet appointments and blood work, take them back to the breeder while waiting for lab results, purchase and prepare crates for departure, obtain health certificates, book all flights, file all permits and make any necessary quarantine reservations as well. 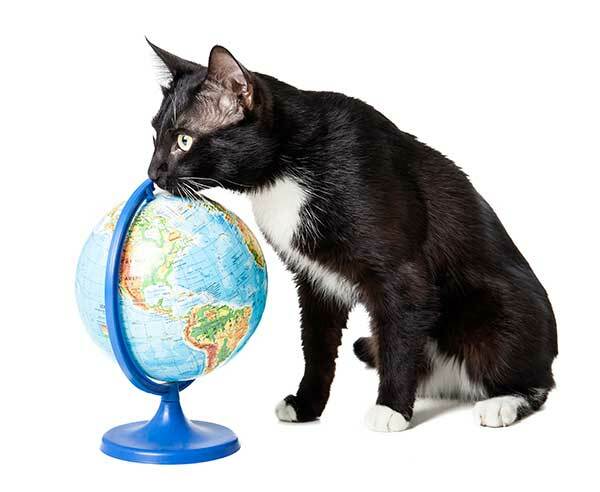 We are experts in the export process for pet relocation to Australia, New Zealand and South Africa. We have contracted directly with one of only two approved labs to process the blood work for these countries. This allows us to turn lab work around in as few as 5 days for your pet’s export to Australia, and 21 days for your pets export to New Zealand and South Africa. We have a full service Veterinarian Clinic located onsite. For our full-service export, we pick up your pets and take them to all necessary vet appointments for any required lab work, final vet visits and obtaining international health certificates. For our clients that do not have someone they want to send their pets along to ahead of time or leave with here on the island, we also offer boarding for clients who need to move prior to pet’s ability to move, or if you do not have housing secured for your famliy. Please in quire early as boarding space is limited. If you do not already have airline approved international travel crates for your pets, we will help you to ensure you get the right crate. Often we work with our clients to do crate swaps, as we all know, one thing we are limited to here in Hawaii is space! Many of our incoming clients do not want to store larger dog crates and are happy to sell them to our outgoing clients. If we do not have a used crate for your pet we can pick one up for you and have it delivered to your home, one less thing for you to worry about! Please note this swap service is limited to our clients using our relocation services. Craigslist is also a great resource for finding used crates in great condition! For our larger dogs we offer custom wooden crates built to specifications for your dog’s comfort. Several countries also have their own requirements in regard to the type of crates they will allow for import. We ensure each country’s compliance is met. If your pet is not already crate trained we suggest you obtain a crate as soon as you are aware of your relocation and start this process right away. For tips on crate training please visit our tips page. All dogs and cats leaving the State of Hawaii for international travel are required to have an International health certificate dated no more than 10 days prior to their flight departure, and a current rabies vaccination. Many international countries also require USDA or Federal endorsements of these health certificates, we ensure all proper documentation prior to your pet’s departure. If you do not have time to get your pets to your own vet, have no worries we can handle that for you as well! We will work with your local vet to get your blood work submitted to the right lab in the correct order required for your import country. File all permits and documentation as listed above, book an inter-island flight for your pet to come to Honolulu in order to catch their international flight. Many of our clients have sent their pets to us a few days ahead of time here in Honolulu, where we prepare the pets for their international travel including all blood work and obtaining health certificates. If need be we can arrange long term boarding on Oahu while required blood work is pending. Our departure service already includes home pickup here on the island of Oahu, if you would like someone to pick up your pets at their final destination and have them delivered to their new home, we can make that happen anywhere in the world! (We offer home pickup for our neighbor island clients at an additional cost). Some countries such as Australia and New Zealand still require quarantine upon your pet’s arrival. We will ensure that all documentation is correct prior to your pet’s departure to ensure that this quarantine is limited to what is required and nothing longer. We have several clients who travel back and forth to Hawaii several times a year and take their pets with them. We will ensure that all of your vaccinations and documents are in order before you leave the island ensuring that your pet will not be held up in quarantine upon their return to Hawaii. There are a few steps that do need to take place prior to leaving, please contact us as soon as possible if you do plan to travel back and forth with your pets. All of our quotes are provided to you in writing – we do not give quotes over the phone, this is to ensure that we have the required information from you about your pet in order to give you the most accurate quote, and also so that you know exactly what is included in writing from us.